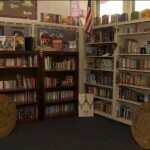 I believe a classroom library is the heartbeat of a teacher’s environment. It is the window into their own personality, and it reflects the importance of literacy in the classroom. I believe every teacher, no matter the subject taught, should have one. 1. THE BRASH BIBLIOPHILE: These are students who are well versed in the language of book choice and seek out what they want, avidly asking questions or using learned or inherent strategies to find the book that will make them sigh into their bed with a flashlight in hand. They will find their way to their local bookstore by any means necessary, and look through the stacks until their parents pull them away. 2. THE PUBLIC LIBRARY LITERATE: These are those students who won’t or can’t go to a store, but who will go to the local library. They, too, have a facility with literacy and are comfortable with seeking out a book, or perhaps asking a question or two from a familiar face. 3. THE LUNCHTIME LURKER: These are those who may only be comfortable at the school library, escaping lunches to be in the dark corners of the school stacks, discovering this character or that plot line, waiting to swipe their ID card and get the book back home. 4. THE FRETFUL PHOBE: And then there are students who are so frightened of books, of literacy, and of choice, that they only feel comfortable in their classroom library, reaching for books they know exactly where to find, and trusting in your advice and confidential knowledge of their fears and literacy insecurities. And it’s up to us, the classroom teachers, to attract all these students like moths to a flame. You need to lure them into your library with choices and with answers. My stacks have every genre, every level. They are peppered with realia from my own life. The silly Snoopy Sherlock Holmes Hallmark doll some student gave me sits next to my Mystery section. 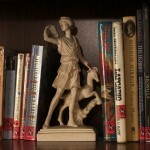 The touristy Artemis statuette I got in 8th grade when my family went to Greece sits nest to my Mythology section. The Shakespeare Action Figure with Removable Quill sits between a full-text edition of Midsummer Night’s Dream and the Manga version of As You Like It. My Jane Austin Action figure reclines amongst my Historical Fiction. My 6th Grade Clash of the Titans lunch box bookends Fantasy. A figurehead of Captain Morgan that hung in my room all through high school glares down at “any who dare not use the proper means of checking out a book.” The statue of “The Raven” that a student gave me (which, I never told her, was really a pigeon) sits next to my Poe action figure as well. They’re all there. Each little chotchkey has a purpose. Each serves to highlight a reading genre. Each helps to entrap my students into the web of literacy that is my classroom library. I have set up a checkout system in my room (and would love to hear how you do it as well) wherein a student fills out a slip with Title, Name, and Date and drops it into a file. When the book is returned, the student shows me they are filing the book on the correct genre shelf and are then, with permission, allowed to tear up their slip. 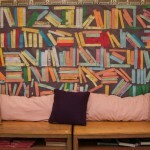 I do a monthly read-off of names to see if books are being read or when they will be returned. And speaking of “genre shelf.” I have purchased genre stickers with icons to represent each genre and label protectors from Highsmith to help categorize the books correctly, so that even the most struggling of student can select and return my books correctly. When I inject new books into the stacks, I select volunteers to put the stickers on them, thus, turning a chore into a mini-lesson, all in one fell swoop. Another option I’ve thought about is offering a basket for students in a hurry to put their book in. I’d then have NJHS kids (National Junior Honor Society students looking for community service hours) file them away correctly during lunch. I have found that at the end of the period, the stacks get a little crazy with the flurry of packing up if we’ve all been reading up until the last moment of class. 3. 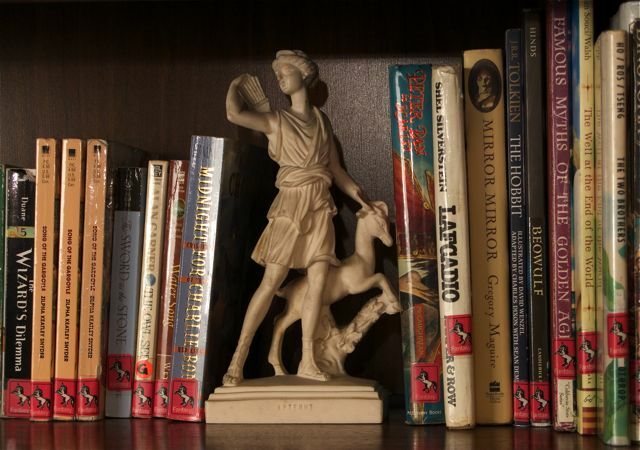 Which book on Mrs. Wolpert’s Fantasy shelf inspired the book, Wendy? Follow up to question #3: what is the title of the Biography about that Fantasy book’s author? Continue involving your library into your lessons. Have the students pull Golden Lines from a book from your library for a homework assignment. Have them design Persuasive Ads to get other students to read a book that they may have loved. To prove the frequency of their reading, have them continuously, throughout the year, fill out “book spines” (see picture) to visually display their efforts. By the end of the year, they will have created their own bookshelves, overwhelming the classroom with proof of their literacy. 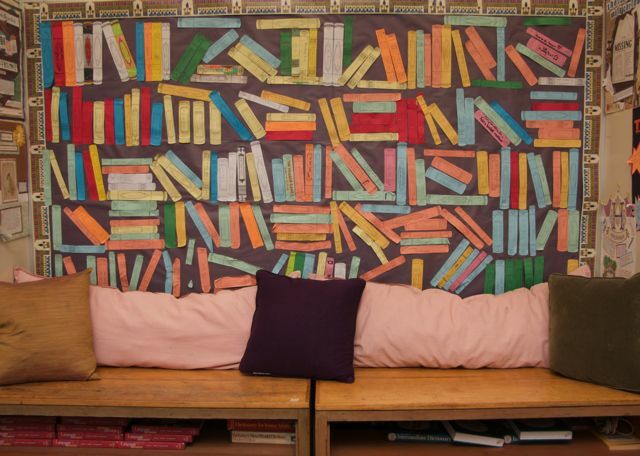 Start building your classroom library a little at a time. Begin experimenting with the checkout process that works for you and that doesn’t take a lot of time and energy in the middle of your day. Ask your students for suggestions. In fact, you can make it a mini-lesson about genre, about what they’ve last read, about persuasive writing, anything that helps them to own the library too. Eventually, you’ll find that students from other classes come to you for advice, for the privilege of checking out your books, and you’ll even find students checking out books that they recommend to younger siblings or parents. 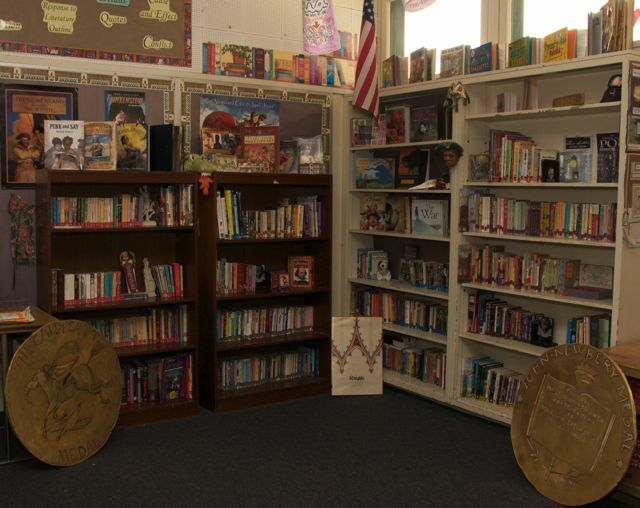 The classroom library should be an interactive part of your classroom. One day, the books may fall apart with use, but remember; there is no better death for a book then having been read too much by too many. how to make a chat bot - how to make a chat bot Get the latest social trends service now available plus at best prices now! marketing firm - marketing firm Get started today with the best rated Marketing that are available in addition reasonably priced today! facebook chat bot - facebook chat bot Get the new technology chatbot strategy technology now available at best prices now! Source - Source Get started today with the best video Marketing that will be available in addition reasonably priced today! fb chatbot - fb chatbot Get the new technology chatbot advertising technology now available on megasale now! online marketing - online marketing Get started now from the best twitter marketing now available and an awesome value today! advanced chatbot - advanced chatbot Get the best how to market with a chatbot technology now available plus at amazong prices now! click site - click site Get started today with the best search ranking consultant that are available and reasonably priced today! seo kalispell - seo kalispell Contract professional direct response marketing now available and a great value today!